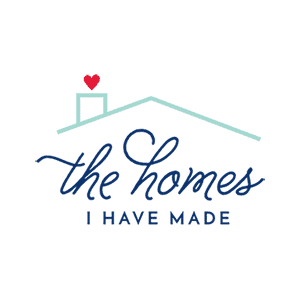 When most of our unpacking and moving in was behind us, I literally couldn’t wait to get started on a few projects I’ve been scheming in my head for months! 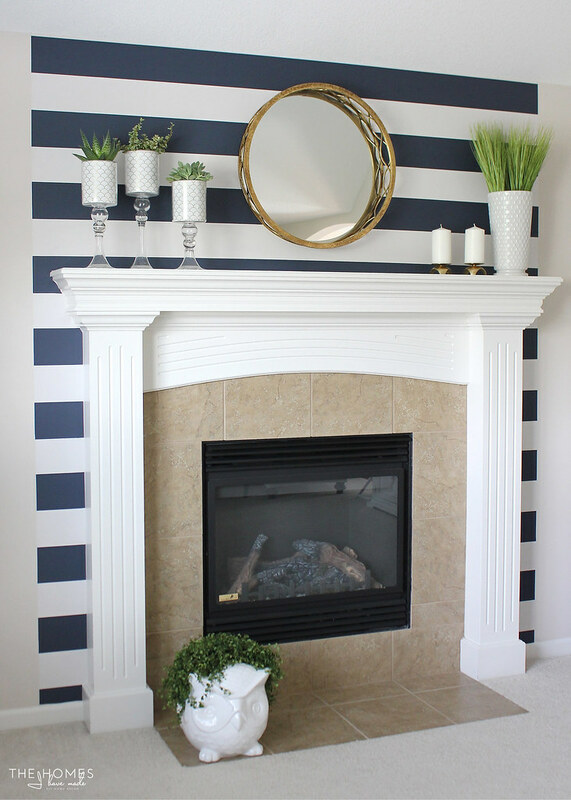 I’ve been sharing sneak peeks of this project over on Instagram for a week or so now, and I am super excited to share our first renter-friendly update to this house: a striped feature wall around the family room fireplace. 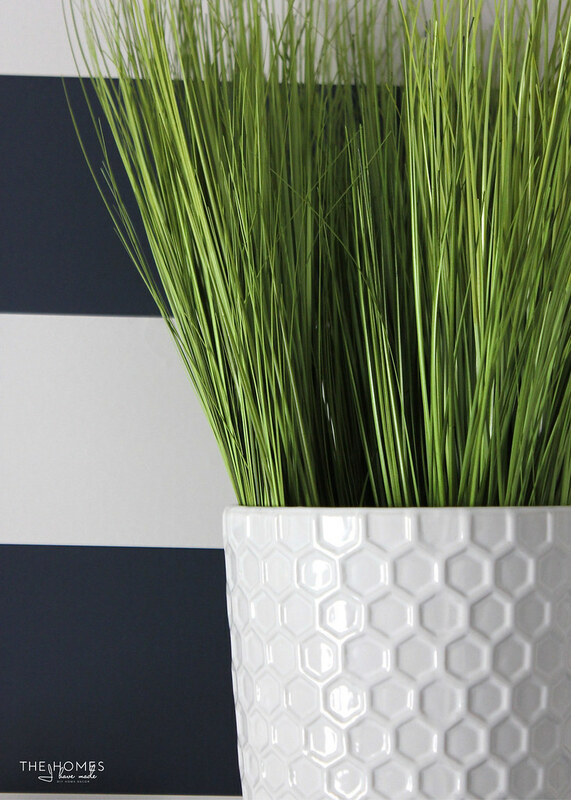 I didn’t paint these stripes…let me show you what I did! Ya’ll know I am a complete sucker for Target clearance stickers. Who’s with me on this one? I’ve been trying to limit the amount of junk goodies that land in my cart lately, but when I see a deal too good to pass up, I pretty much can’t resist. 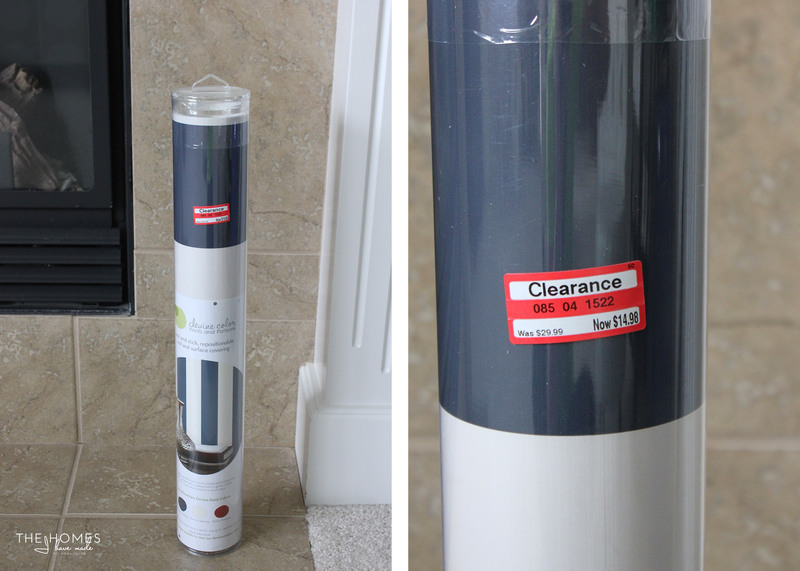 Months ago…seriously, months ago…I came across this blue/white striped peel-and-stick wallpaper with…you guessed it…a red clearance sticker. 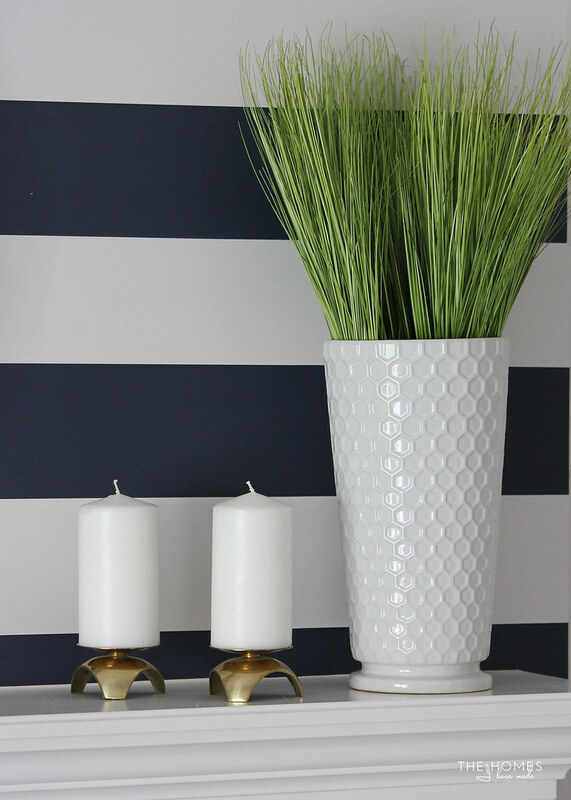 I pretty much fall for blue and white stripes on anything; and for $15, I knew I’d find a place to use it in our new home somewhere! Back when we decided to rent this house and I saw the pictures of the fireplace in the upstairs family room, I had my mind set on using the wallpaper to do some sort of feature around it. Once the boxes were unpacked, I literally couldn’t wait to jump into this project. Here’s where I started. 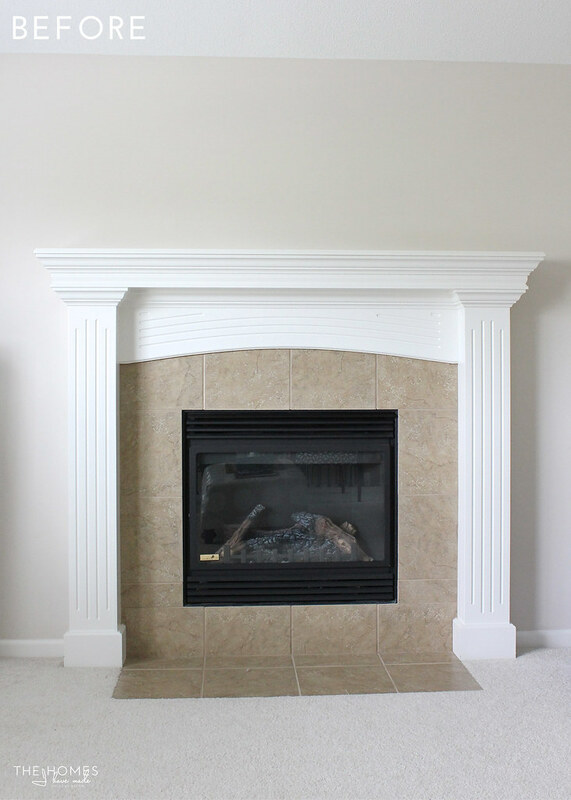 The fireplace and mantel are deceivingly big: the mantel measures 56″ in height, and the space above the mantel to the ceiling is 36″ high. The whole thing is about 76″ wide! My very first step, which I forgot to photograph (sorry!!!! ), was to sketch and plan on a sheet of paper. I only had one roll of the wallpaper that measured 20″ x 16.5′ and had no intentions of buying any more. I had an image in my head, but before cutting and applying the paper, I had to make sure I had enough paper to achieve the look I wanted. I roughly sketched out the dimensions of the mantel and the ceiling hight, and then taking into account the measurements and pattern repeat of the paper, figured out how best to lay it all out. 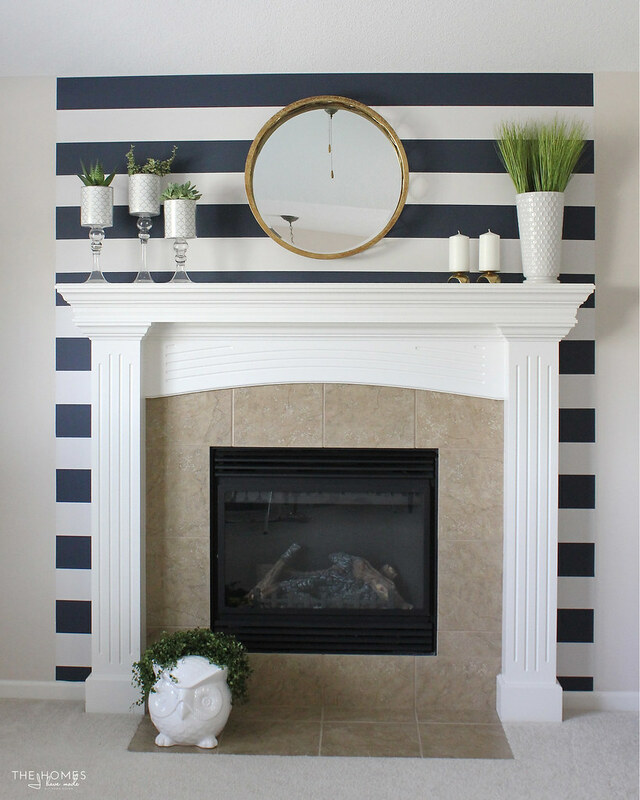 After playing with a couple different options, I determined I had enough paper to extend the stripes 2″ beyond the mantel on each side, as well as down the sides of the fireplace. Once I had my plan in place, I used a level and plain ol’ masking tape to mark out vertical lines to act as my outside borders for the paper application. 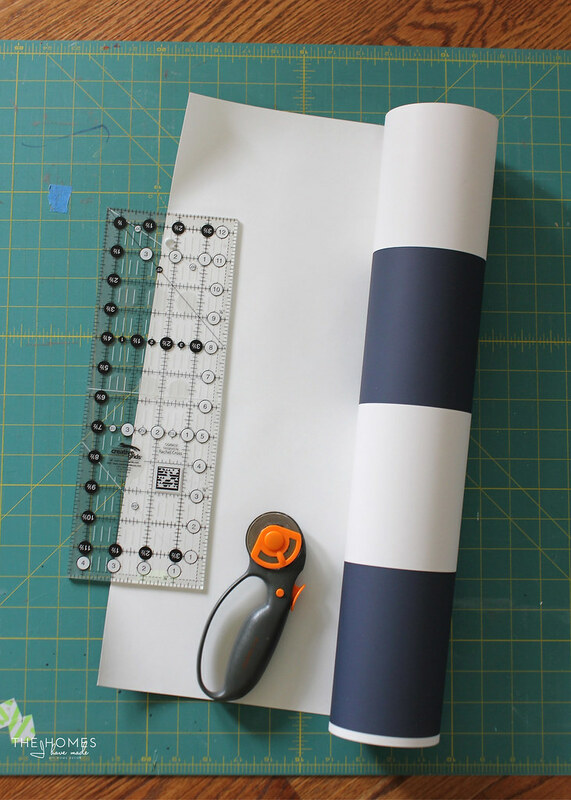 I then used a rotary cutter, ruler, and mat to cut my paper down to the right lengths, which for me, was 80″ strips (at least for the top). I can’t stress enough how important that sketching/planning part is. As I was playing with different ideas, I realized that the top of the wallpaper had a white stripe. Because I wanted the paper to contrast with the white ceiling, I needed a blue strip across the top. While I could have just flipped the paper, see that tiny white edge along the bottom of the roll? That’s to help line up the next section of paper. I needed that tiny strip on the bottom to help lay out the rest of the paper down the wall. 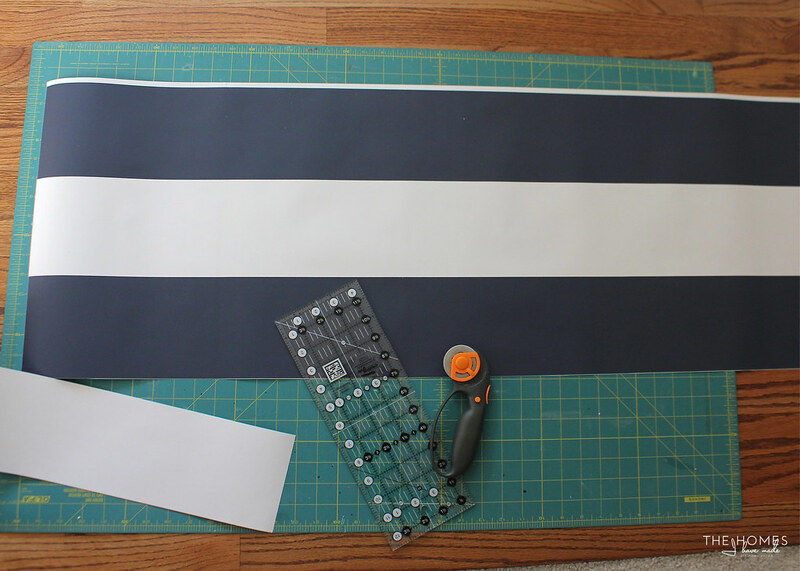 After some more sketching and planning, I ultimately determined I had enough paper to trim off the top white strip so that I could have a blue strip running across the top while still having my small white guide strip along the bottom! I don’t have installation photos for you. Not because I forgot, but because getting the long strips of paper up onto the wall above the mantel without creases or bubbles took both Greg and I working together up on stools. In all honesty, putting the paper on the wall wasn’t the easiest thing in the world. Our strips were 80″ long, and that’s a lot of paper to hold and level and place and smooth so that there are no bubbles and the lines run straight. The good news is that this paper peels off the wall and repositions beautifully, so with some perseverance, the first two strips were placed in about 30 minutes! 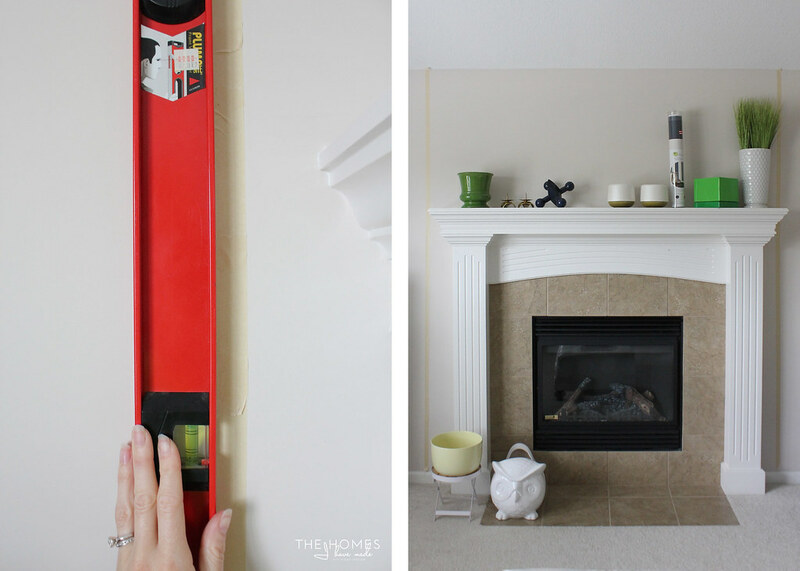 Once the long strips were up, I was able to work down the sides of the fireplace with more manageable pieces of wallpaper. 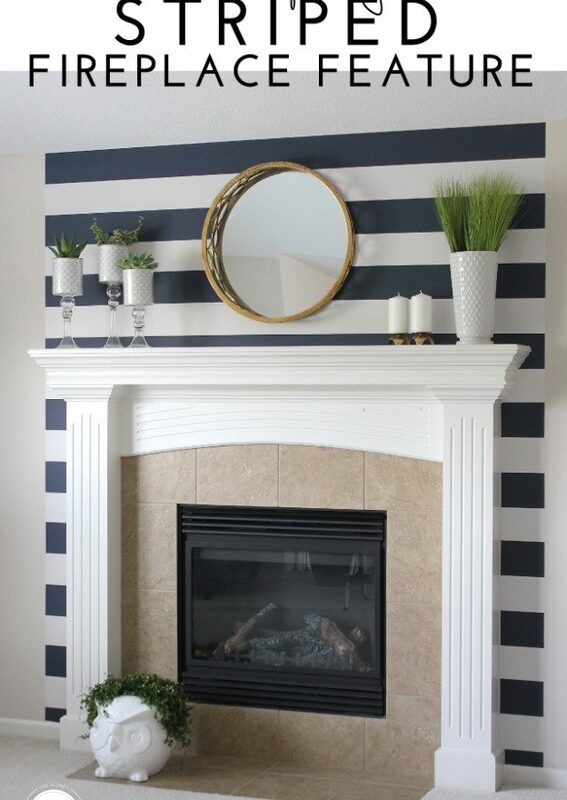 The only tricky part here was working around the fancy molding on the mantel. Once I had the paper placed, I carefully cut away the paper with an Xacto knife, essentially tracing along the edge of the mantel. It’s not perfect, but from a distance you can hardly tell! Not counting the measuring, sketching, and calculating, the wallpaper installation took us about an hour after Henry went to bed. I’ve said it before and I’ll probably say it many more times: never underestimate the power of a good stripe! 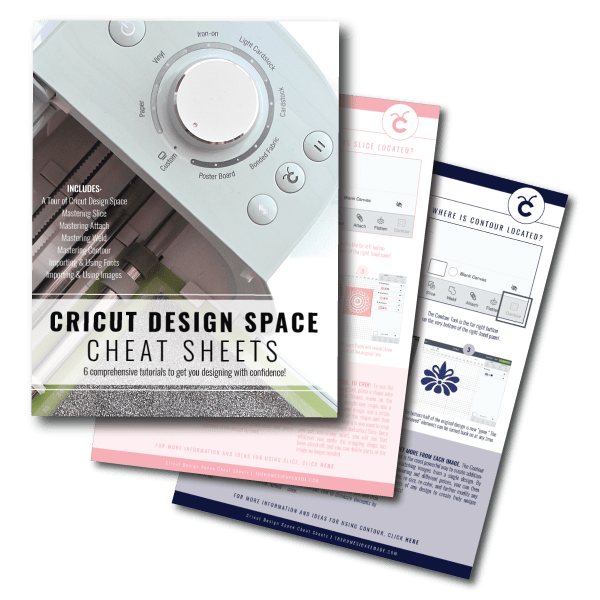 Even in small doses, it can completely transform a space. Even I couldn’t believe it when I stepped back and saw the result! With the wallpaper up, I couldn’t wait to get some of our other accessories up off the floor and on display! 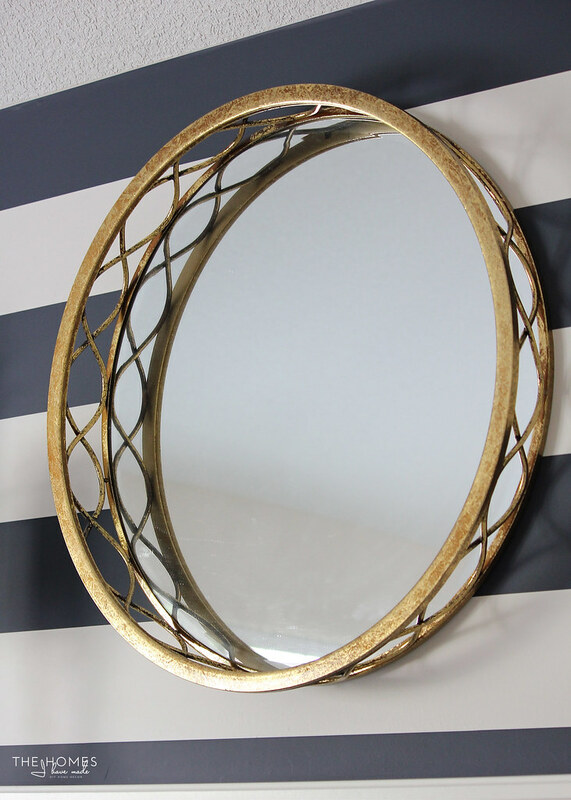 The brass-colored mirror is one of my favorite recent purchases. I actually bought it just before leaving North Carolina while I was on a shopping trip with a girlfriend to furnish her house! 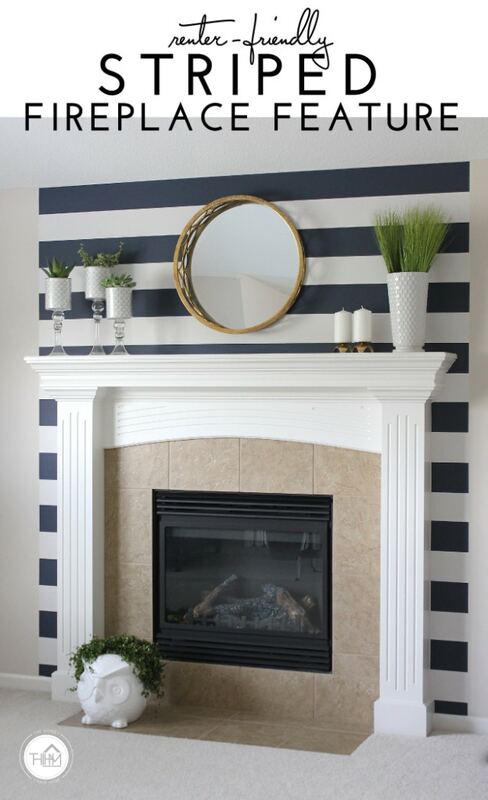 I didn’t know the measurement of the space between the mantel and the ceiling; but when I saw it, I knew it would look amazing on the blue and white paper. I was SOOO excited when it fit oh-so-perfectly! The vase was another Target clearance score from ages ago. I’ve had it stashed away because I never had a good spot for it in the last house. I’m so excited to finally have a place for it. The grass is fake from Michaels and used to be in our playroom. It’s one of the only fake plants I’ve owned that actually looks pretty great! 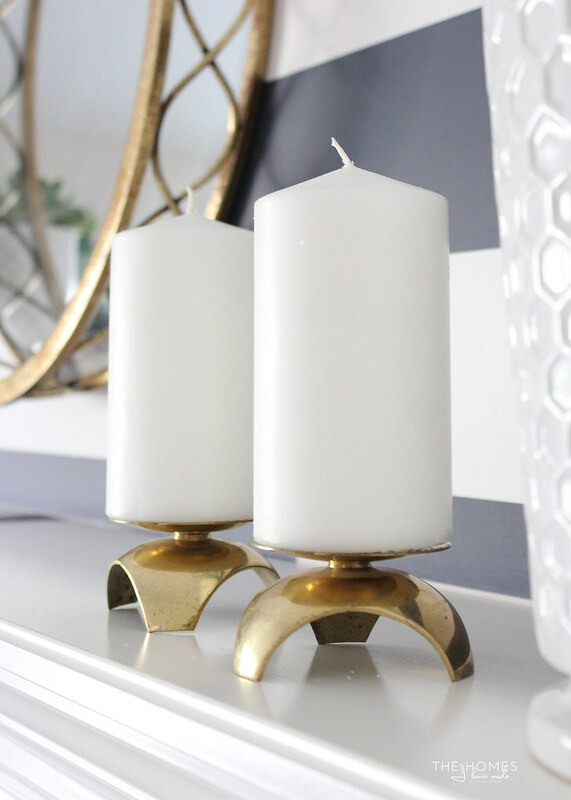 These brass candle holders were a treasure from my parents’ basement. I love their unique shape! I initially had a tough time figuring out what else to put on the mantel to balance the white vase and candles. I’m trying so hard not to go out and buy new things in situations like these, so I turned to my prop/party/decor stash. These glass candlesticks, which I normally use for parties, were the perfect size and scale, but I didn’t want to add more candles. I decided to give succulents another try…fingers crossed I can keep these babies alive this time! 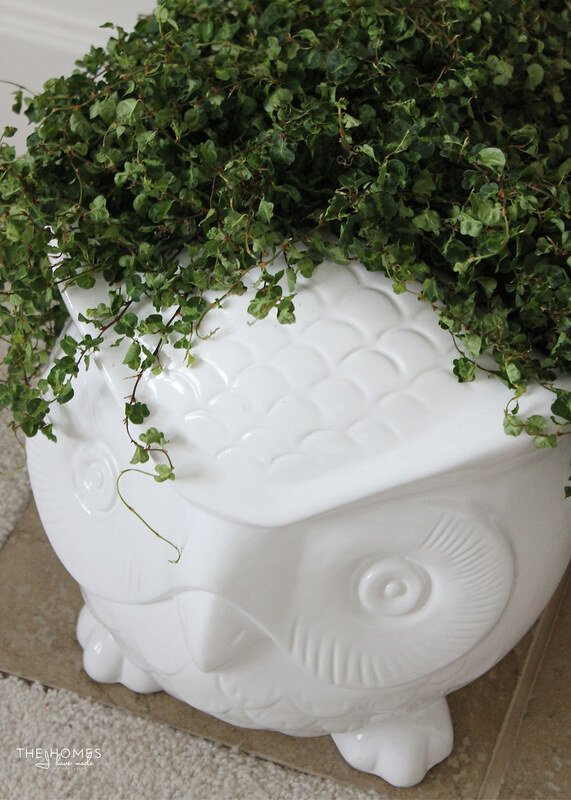 My favorite planter, Mr. Owl, has been put in his new place and given a new head of hair! We’re going for a more disheveled, tussled look this time around! Stripes, brass accents, white pottery, and some plants all together really help make this new house feel like home already! This wall is officially my new happy spot. 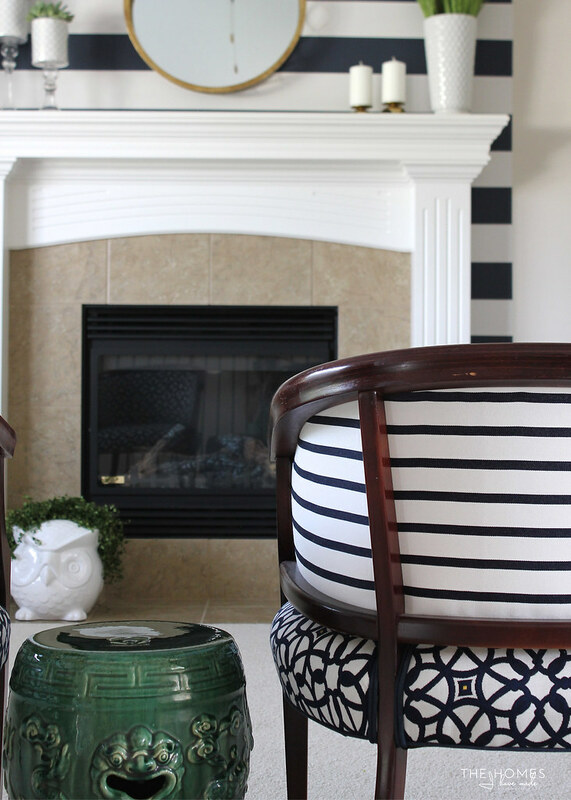 And for those of you out there who have seen these chairs and are wondering…yes…this is exactly the direction I’m going, and I cannot wait to pull the whole room together!!!! Peel-and-stick wallpaper can be VERY pricey. At full price, this roll would have been $30, and I’ve seen prices much higher than that on other sites and stores! 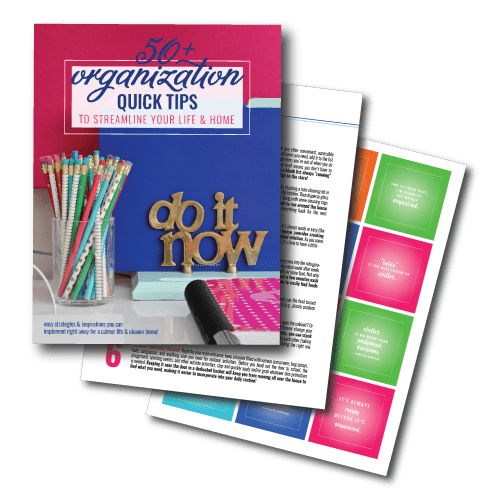 If you wanted to do an entire room or even an entire wall, it can really add up fast. 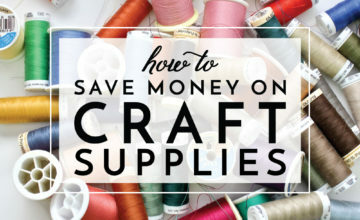 Keep an eye out for sales, clearance items, and discounts for similar products. To keep costs way down, use temporary wallpaper in a nook or to define a small space (like I did here). 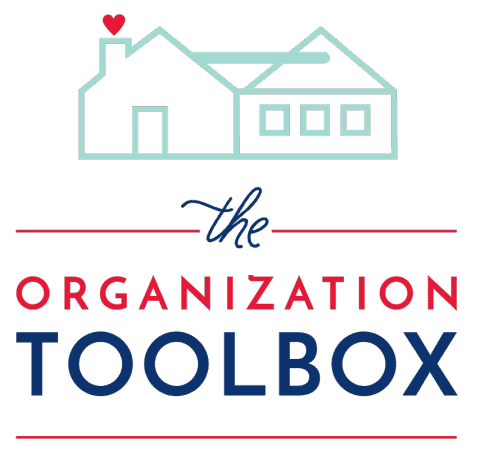 With some planning and brainstorming, a single roll can go a long way! Adding this completely temporary peel-and-stick wallpaper, even in a small dose, completely changed the look and feel of an otherwise bland and boring room. Not only does the paper provide a focal point for the whole space, but the high-contrast pattern adds life and vibrancy to the room. For $15 and an hour of time, I’d call this one a success! I’d love to know what you guys think? 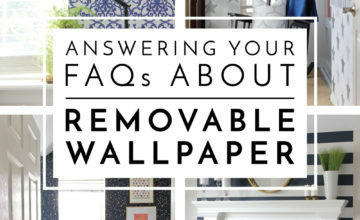 Have you used peel-and-stick wallpaper? 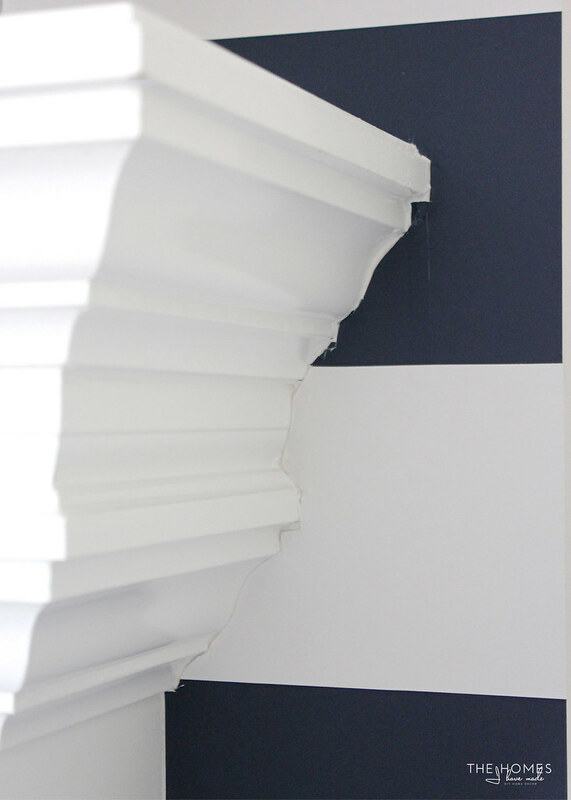 Have you ever considered using paper to accent a small space? Are you shocked that my very first project involved getting some stripes into our new space? #cantstopwontstop !!!! Hope you’re week is off to a great start. 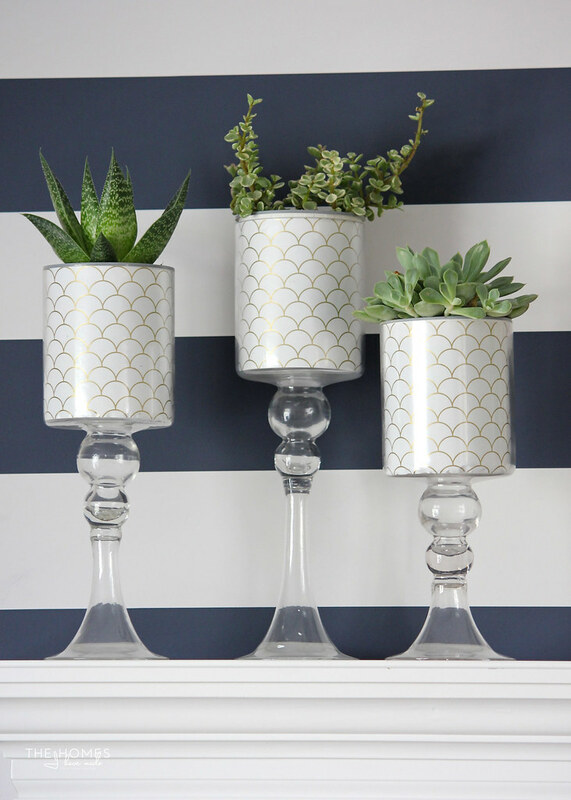 On Wednesday, I’m going to share a quick round-up of some other completely renter-friendly wall treatment ideas. See you then! We're Here For a Year - Let's Do This! I LOVE this!! What a bold statement without being permanent!!!!! This looks great! 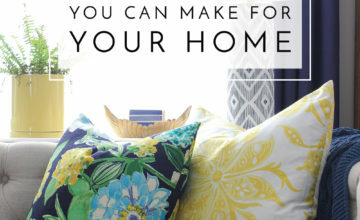 What a transformation and creative way to spruce up an otherwise bland room and on a budget?! What can't you do? 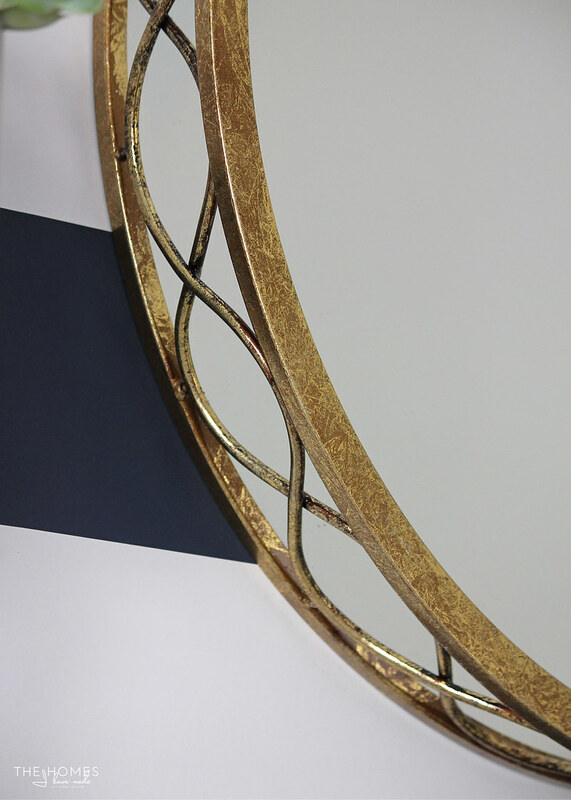 The accessories make it and finish it of so well, I love the scheme and colors can't wait to see the final room. 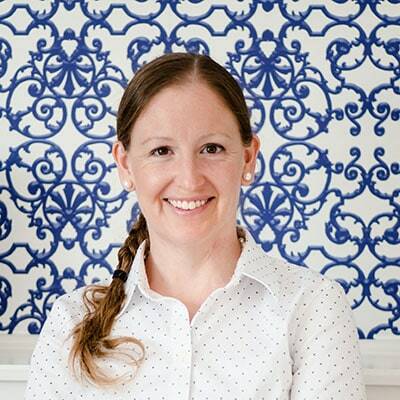 I thought of those chairs the minute I saw the striped wall – they fit in perfectly, and your new project looks great!